The 3D Preview Settings are available from the settings of the DriveWorks Administrator and DriveWorks Autopilot modules. Multiple DriveWorks Autopilots can be used to generate 3D Previews. Please see Info: 3D Preview Load Balancing for more information. With this option checked DriveWorks Autopilot will be used to generate any required 3D Preview files. Ensure DriveWorks Autopilot is not currently running. Locate DriveWorks Autopilot launch icon from Windows start menu> All programs> DriveWorks <Version and Service Pack Number>. Hold down Shift key and Right click the icon. Please ensure the DriveWorks 3D Export Add-In is set to load on Start Up in SOLIDWORKS on the machine Autopilot is generating 3D Previews. By default, these files are stored in a [GroupContent]\3DPreview\Temp folder. 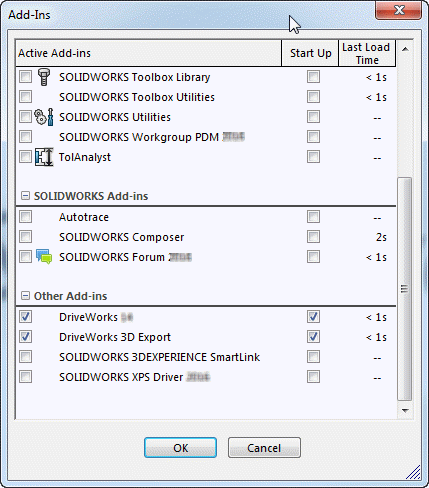 Use the browse button to select an alternative location to store these SOLIDWORKS files. Click the Add Exception button to prevent Windows from blocking communications attempts. This will add an exception to the firewall for the port needed to receive 3D previews on the Autopilot machine. The computer running DriveWorks Autopilot will require its Firewall settings adjusted to allow connection to the 3D Preview service. Please refer to Autopilot: 3D Preview Settings for more information.